Katerina Akassoglou is selected as the 2018 recipient of the Barancik Prize for Innovation in Multiple Sclerosis Research. 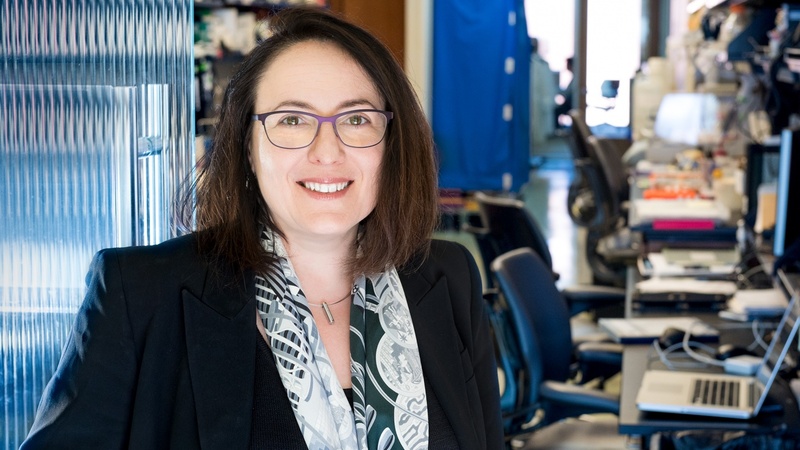 Katerina Akassoglou, PhD, a senior investigator at the Gladstone Institutes, is the 2018 recipient of the Barancik Prize for Innovation in Multiple Sclerosis Research. She was recognized for her relentless pursuit of an original line of research and her tenacious dedication to the development of therapies for multiple sclerosis, according to a press release from the National Multiple Sclerosis Society, which administers the prize. Akassoglou studies the role of blood proteins in the development of a variety of neurological diseases, including stroke, Alzheimer’s disease, spinal cord injury, and multiple sclerosis. Her team demonstrated that when the blood-brain barrier is damaged, the blood-clotting factor fibrin reaches the brain and can activate immune cells known as microglia. This causes inflammation and, eventually, the nerve damage associated with multiple sclerosis. The team went on to show that in mice, an antibody against fibrin could reduce microglia activation and the subsequent damage to nerve fibers. Akassoglou is now translating this finding into potential therapies for multiple sclerosis aimed at reducing fibrin’s ability to cause nerve damage without impairing its critical function in blood clotting. Her work shows that targeting fibrin has the potential to protect against nerve damage at both early and late stages of the diseases, with important implications for patients facing multiple sclerosis disability and progression. The Barancik Prize for Innovation in Multiple Sclerosis Research rewards exceptional innovation and originality in research relevant to multiple sclerosis, emphasizes research leading to the development of treatments or cures for the disease, and identifies future leaders in multiple sclerosis research.